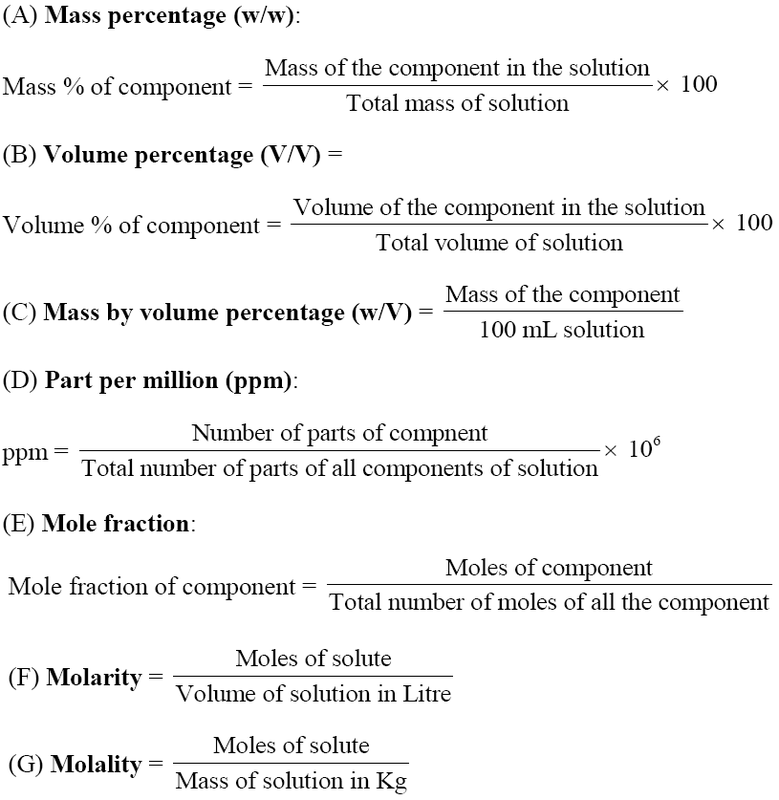 Solution is an important chapter of CBSE Class 12 Physical Chemistry. 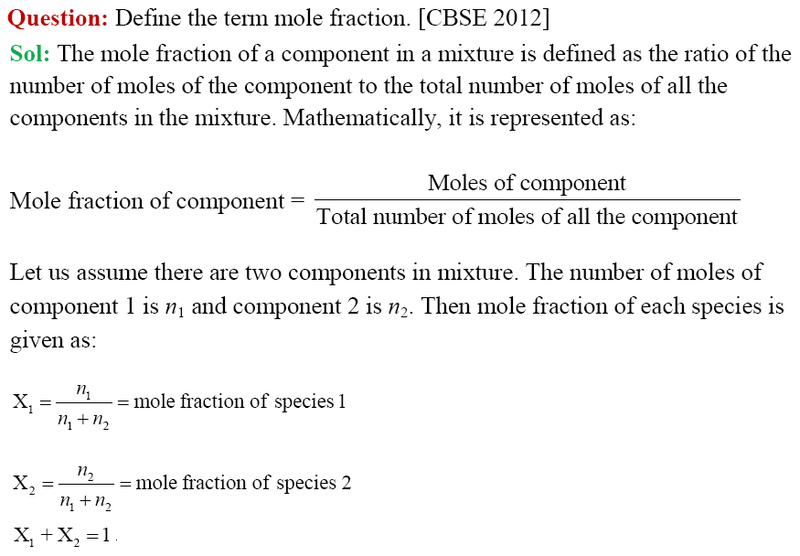 Concepts used in this chapters are further used in other chapters of CBSE Class 12 Chemistry. In this article, we have provided notes (Part - I) on this chapter. The topics covered in these notes are: Solutions, types of solutions, Different Methods of Expressing Concentration of Solutions, Solubility and factors affecting solubility, Henry's law. Chapters in CBSE Class 12 Physical Chemistry are: Solid State, Solutions, Electrochemistry, Chemical Kinetics and Surface Chemistry. The weightage of these chapters in CBSE Class 12 Chemistry board exam is 23 Marks (out of 70). 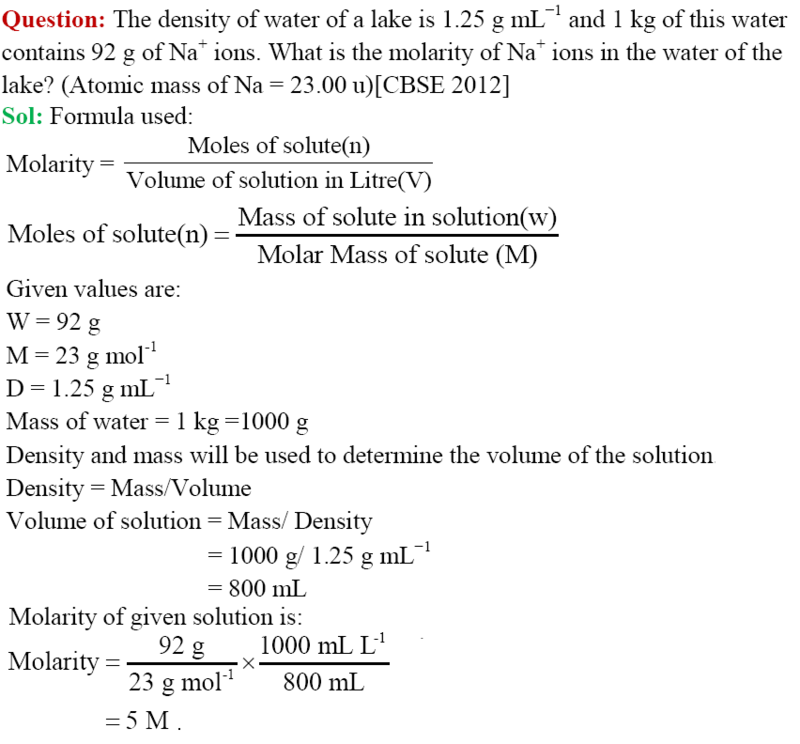 Solution is an important chapter of CBSE Class 12 Physical Chemistry. Given below is the Part I of Chapter Notes on Solution, which is chapter number 2nd of NCERT textbook. A Solution is a homogenous mixture of two or more components. It is defined by using the terms solute and solvent. Solvent: The component that is present in largest quantity is called solvent. It determines the physical state of solution. 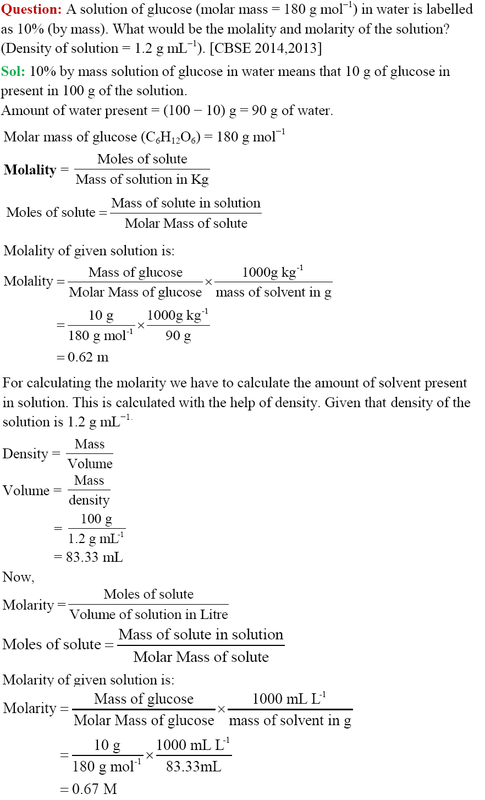 Solute: One or more components present in solution other than solvent is called solute. Binary solutions: Solution consisting of two components only. In this chapter we are mainly focusing on binary solutions (solution made up of two components) of liquid known as liquid solutions. If the nature of solute and solvent is same, the intermolecular force of interaction would be same. That helps in solubility of solute in solvent. Polar solute dissolves in polar solvent. For example: NaCl and sugar dissolves in water. Non-polar solute dissolves in non-polar solvent. For example: Naphthalene and anthracene dissolves in benzene not in water. Saturated solution: If the concentration of solute in solution remain constant at given set of temperature and pressure is called saturated solution. If we add more solute in it, it would precipitate out. Un-Saturated solution: If the concentration of solute in solution can increase at given set of temperature and pressure is called un-saturated solution. If we add more solute in it, it would get dissolve and increase the concentration of solution. The solubility of solute in solvent always follows the dynamic equilibrium. It follows the Le Chateliers principle for the change in temperature at dynamic equilibrium. If the solution is formed by giving heat means dissolution is endothermic. By increasing the temperature, the reaction will proceed in forward direction and solubility of solute increases. If the heat is released in formation of solute means dissolution is exothermic. By increasing the temperature, the reaction will proceed in backward direction and solubility of solute decreases. Pressure has no significant effect on solubility of solid in liquid. Solubility of gas in liquid is also somewhat affected by nature of solute and solvent. Oxygen dissolves only a small extent in water but HCl is highly soluble in water because of polar nature of solute and solvent. Solubility of gas in liquid is highly affected by temperature and pressure. As the pressure of the gas above the surface of the liquid increases, it increases the solubility of gas in liquid. The quantitative relation of this equation is given by Henry’s Law. Different gases have different KH values at the same temperature. That is KH depends on the nature of gas. Higher the value of KH at given pressure, lower is the solubility of gas in given liquid. KH value of particular gas increases with increasing temperature. It indicates that solubility of gas decreases with increasing temperature. Dissolution of gas in a liquid is an exothermic process. As dissolution process involves dynamic equilibrium, it follows Le Chaterlier’s principle. Hence the solubility of gas in liquid, decreases with increase in temperature. 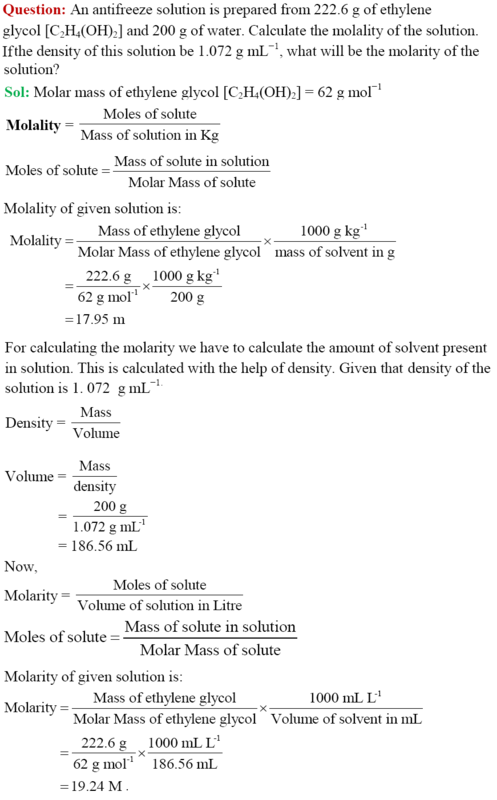 Sol: Henry’s Law give the relation between pressure of gas with its mole fraction in a liquid solution. The solubility of gases in liquid is dependent on temperature. An increase in temperature results in a decrease the solubility of gas in liquid, while a decrease in temperature results in an increase of solubility of gas in liquid. Dissolution of gas in a liquid is an exothermic process. As dissolution process involves dynamic equilibrium, it follows Le Chaterlier’s principle. Hence the solubility of gas in liquid, decreases with increase in temperature. Or in other words, when the temperature increases the kinetic energy of the molecules also increase. This will result in more rapid motion of molecules, breaking intermolecular bonds and enable the molecules to escape from the solution. So, the dissolved gas evaporates more readily. That is rise of temperature will cause decrease in the solubility of gases in liquids. Some of the applications of Henry’s law are given. (i) To increase the solubility of CO2 in soft drinks and soda water, the bottles are sealed under high pressure. (ii) The air used for scuba diving is diluted with He to prevent the medical condition known as bends.